When the superheroes need saving, they turn to ones they trust the most. That's why Iris West is The Flash's hero. Not every hero is out on the street saving people. Some support the superheroes, giving them strength when theirs falters. When the superheroes need saving, they turn to ones they trust the most. That's why Iris West is The Flash's hero. Though it took twenty episodes for Iris to find out Barry was The Flash, she'd already begun her support of this hero in red with her blog. She knew there was something different about this superbeing, and she trusted her instincts. It's those instincts that make her an asset to the team now. She doesn't need to be a scientist or doctor to contribute because she knows Barry better than anyone on the team, and it's that knowledge that makes her vital to Barry's ongoing quest to save Central City. Instead of being a brainiac like a Caitlin or Cisco, Iris’ intelligence comes from a more visceral place – it’s intuition, it’s feelings, it’s touches, senses and things like that. In Season Two, Iris has shown herself to be a hero without superpowers. 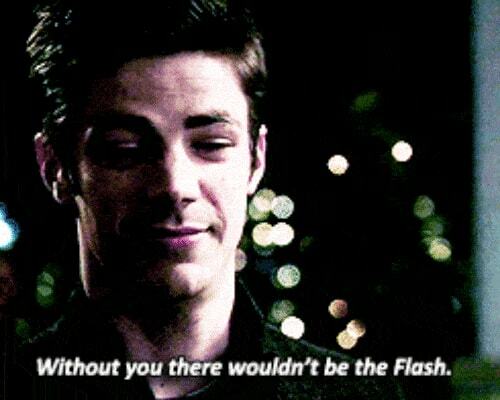 To Barry, she is the reason The Flash exists. She helps him focus, stay true to his principles, and believe in himself. Iris is Barry's anchor, the one person in life he knows he can trust implicitly. Having someone like that in his life is as important as Cisco with his cool gadgets. Iris shows Barry what he's fighting for, why he's fighting, and gives him a reason to be the true hero he's becoming. Iris knows the man beneath the suit, and she focuses more on him than the powers he has. She's his true north which makes her just as much of a hero as The Flash. Read next: What Hidden Meaning Is There in the 'Batman Vs. Superman' Trailer? What Hidden Meaning Is There in the 'Batman Vs. Superman' Trailer?